Why limit yourself to the beach? 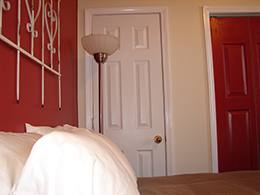 The Beacon House also offers a vacation rental right in the heart of historical Downtown Wilmington. A mere 25 minute drive from Carolina Beach, the city of Wilmington drips with southern charm and metropolitan flair for travelers looking for a little city life. Our City Flat is located only two blocks from the popular Riverwalk and an even shorter walk from many fine dining establishments and shops. Google map us at 17 South 2nd St between Market and Dock. Included with your rental is one complimentary dedicated off street parking space directly across from the building. 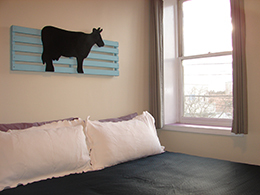 Our 850 square ft. flat is a two-bedroom / two-bathroom 2nd floor walk up decorated with artwork from local artists and provides a plethora of modern amenities including a newly renovated kitchen. The master bedroom has a king bed with en-suite bath (stand-up shower) while the second bedroom has a queen bed and full bath (with shower/tub combo) located just outside of the room. 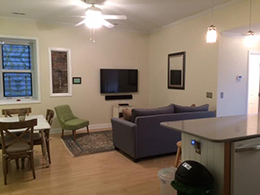 Complimentary WiFi and a 55 inch LG Smart TV with cable and Bluetooth wall mounted speaker are also available. The accommodations are family and dog friendly (one dog maximum) and we accept up to 5 people (please note, the 5th individual may utilize the fold out sofa which is more suitable for children than adults). 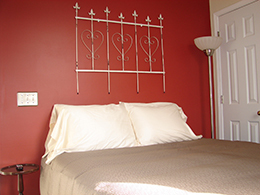 If you are traveling as a pair (2 adults), we also have a Queen room couple/double occupancy only rate. Please call the Inn for details. There is a 2 and sometimes 3 night minimum during high season months (April/May – September + event season weekends). 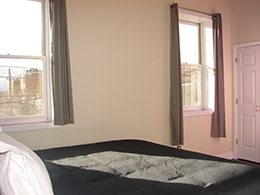 Shoulder and off season months also require a 2 night minimum (October – March). Rates are seasonal and range from $179/night – $249/night + tax. 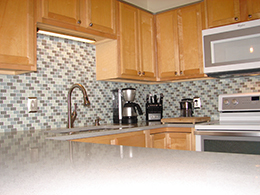 Click here to view the availability chart as well as to make an online reservation. Linens (sheets, towels, pillows, etc.) and a setup of essentials including hotel size shampoo, conditioner, lotion, and soap are provided. Our signature coffee from Carolina Coffee Company is also available (the same bean we serve at our beach Bed and Breakfast). Important note: Our City Flat is in a different location than the beach. It is self check in / out and self catering (breakfast is not included). Please be advised that the historic district of Wilmington is lively and perfect for people looking for the sweet sounds of city life. Self check in anytime after 3:00 PM. Entry and parking instructions will be emailed with your confirmation. It is very important that you print the instructions and travel with them. Same day reservations are not accepted online and must be approved via phone reservation prior to arrival. Same day reservations are also not accepted in the City Flat after 6:00 PM. The flat is 100% smoke free. Smoking inside will result in a $500 cleaning fee. MAXIMUM occupancy is five (one must be a child). Parties larger than the maximum occupancy will forfeit their deposit along with any balance payment with the reservation terminated. The City Flat is not a place for large gatherings or parties as guests are expected to be respectful of other building tenants. Lost key or lock out. If this happens to you at any time during your visit, you will be charged a lock out or lost key fee of $150. Not fun for either of us. Guests must have a major credit card to make a reservation and be at least 21 years of age. Pet policy: a maximum of one dog is allowed. There is an additional fee of $25 per day for your dog. All guests are responsible for cleaning up after their four-legged friend. There is a dog amenity basket included with your rental/pet fee (dog bowls, towel/sheet, wipes, baggies, etc.) are located in the pet amenity woven basket hamper in the south east corner of the living room under the window. Please feel free to utilize these items (specifically the dog sheets for the furniture). You must crate your dog when not in the flat. Guests are responsible for any and all damages to the flat during their stay. 50% deposit is processed with the credit card provided at the time of reservation. The balance is processed upon your arrival day. We accept all major credit cards: Visa, Master Card, and American Express (no cash or checks are accepted). All cancellations will be charged a $35 cancellation fee. For cancellations inside of 10 days, the deposit will be forfeited. For cancellations outside of 10 days, guests will be refunded the balance deposit (less a $35 cancellation fee) or may utilize the balance as a credit good for one year of the cancellation date. For rates, availability, and to book, click here or call the Inn. Make it a City and Surf vacation! Experience all of what our area has to offer and book a room in our beach bed & breakfast or try one of our beach cottages along with your City Flat rental for a special package rate! Please call the Inn for details.